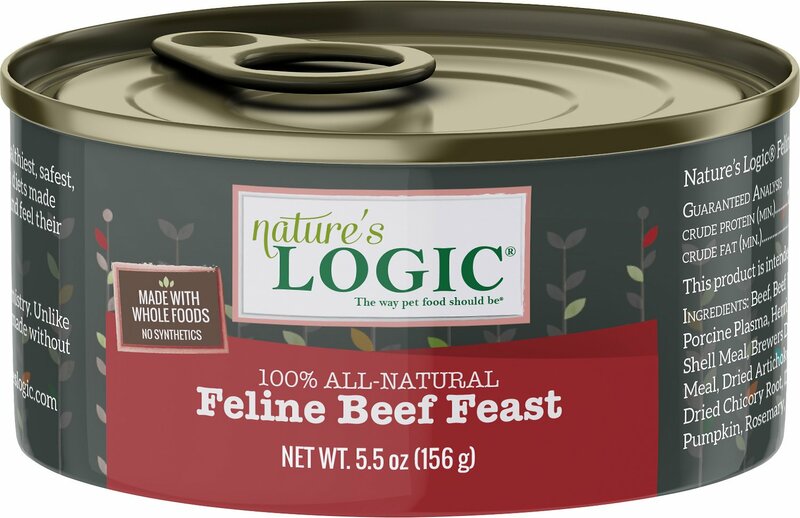 Made with whole foods and natural ingredients, Nature's Logic Feline Beef Feast Grain-Free Canned Cat Food is a delicious and nutritious treat that your furry friend will love! Purr-fectly palatable and savory, this nutrient-dense and protein-rich wet cat food has beef listed as the first ingredient and contains concentrates of select fruits and vegetables. To support your friend’s digestive health, this tasty feast also contains a unique source of natural eggshell calcium and plasma protein containing high levels of natural vitamins, minerals, as well as albumin and globulin proteins. Lastly, this feline formula is made without wheat, corn, rice, soy, potato or chemically synthesized vitamins, minerals, or trace nutrients so you can rest assured that your purring pal is getting nothing but the best. 100% all-natural beef listed as the first ingredient and contains over 90% animal protein for nutrition that closely resembles a cat’s primal diet. 100% grain-free and gluten-free formula that’s low in carbohydrate for felines with food sensitivities. Made without by-product meals, so your furry friend gets nothing but the best quality ingredients. Contains whole foods such as apples, apricots, blueberries, kelp and carrots for nourishment that’s derived from nature. 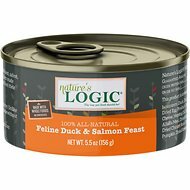 Nature's Logic cat foods all contain naturally occurring taurine found in the organ and muscle meat instead of an added synthetic form of the amino acid. Feed according to the age, size and activity of your cat. Feed at room temperature and refrigerate unused portion. Your cat should always have access to clean, fresh water. Adult: Feed 3/4 can per 6-8 lbs of body weight per day. Kitten: Feed up to twice the adult amount to kittens. Gestation & Lactation: Feed up to three times the normal adult amount. Introduce Nature’s Logic® gradually, over a 7 - 10 day period, to ease your pet’s transitions to the new diet. Nature's Logic provides pet parents with all-natural pet food options to help them thrive. They use the highest-quality protein sources from meat, poultry and fish, plus carefully selected fruits and vegetables. It's truly a 100% natural diet that gives pets the essential nutrients they need without the use of synthetic supplements. All of Nature's Logic's cat food options, from their kibble to their canned foods, derive the essential nutrients your cat needs for a healthy life from natural, wholesome food ingredients. There are no chemically synthesized vitamins, minerals or amino acids added or any artificial colors, flavors or synthetic preservatives used. Nature's Logic believes that your cat's food should reflect the diet that their ancestors thrived on, so they make sure to only use the highest quality animal proteins. In both their canned and dry food lines they offer a wide range of proteins like chicken, rabbit, sardine and turkey, as well as additional canned food options with beef, and duck and salmon. The essential nutrients that your cat needs to thrive are all provided through natural ingredients. Nature's Logic cat foods all contain naturally occurring taurine instead of an added synthetic form of the amino acid. Since taurine is an essential amino acid that a cat's body cannot make themselves, it is necessary that they obtain it through their diet. Nature's Logic began developing pet foods in 2005 with the intention of creating balanced recipes that do not rely on synthetic supplements to meet required nutritional levels. Their ultimate goal is to provide pet parents with a wholesome and nutritious pet food made with safe, natural ingredients that they can feel good about feeding their dogs and cats. My cats were hesitant about this food. They did eat it willingly, in rotation with other foods, for a few weeks, but then they started to refuse it. They accept it more if I dilute it with water, but even then they do not eat much of it. Although the ingredients and calorie density are great, I won't order it again. I'm mainly posting this as a warning to people whose cats have a fish (protein) allergy but are OK with fish oil. This flavor of Nature's Logic contains both Herring oil (which is OK) and sardines (which are not). Too bad. I'm having good luck getting my girls to eat the rabbit and chicken flavors, but they can't try this one. To those disuaded by the reviews that complained about the dryness of the food, the only thing you have to do it add some warm water or pet-safe bone broth to it. Problem solved. My 4 cats did not eat this food. I left some in their bowls overnight, and they refused to eat. I will not be spending $40 on this brand again! I really want to like this, but my cats don't. I really want to like Nature's logic. This is a brand recommended by trusted fur parents. The ingredients are very good and it does not have guar gum. And the cost per once is lower than Instinct. Unfortunately, my cats refuse to eat it and I have to donate the case. I still recommend this product because of its natural ingredients but try a sample first before you purchase a large quantity. He likes it, but I have to water it down, because it is so dense. when I put the water and he drink it, it becomes minced. But it is minced very small. I won't buy it again. Mu cat is old and have some preferences. So far so good. They go crazy for feeding time, so it must be fantastic! My almost 17 year old loves this food. I do wish it came in smaller cans. He was very interested in eating last night and ate all night long. Since I actually made him a Tri-Tip last week to get him to eat, this makes more sense. To say the least, I will do anything for him. Really good ingredients and an ethical company. 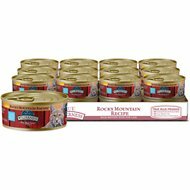 I found this food after researching the best type for my cats, and they love this flavor the best. Thank you because I couldn't find it in stores! My two kittens love this wet food! They even prefer it to the dry food I feed them. Great ingredients too.